The expansion of roads and of mobility removed from the limits of human attention made the self-driving car a particularly tempting commodity of the future. But do the maps that are being designed for self-driving vehicles also not suggest their limitations? These maps promise new means to bring to amassing of data to put places on the map comes at potential costs, however, by creating a downloadable cloud-based record of space able to substitute for drivers’ own intelligence, or indeed the evolved tacit knowledge of roadways. Indeed, even the hopes to provide a high-density record to be able to navigate roadspace leaves an eery imprint for what it leaves out, and trace a rather ghostly skeletal system of roadways, raising compelling questions about the sort of space that maps serve to embody and the ability to recreate or preserve tacit knowledge of roadways and driving skills. For rather than trace the deserted roads of an imagined landscape that one might be compelled to or inspired explore with curiosity, the streets blanched of a world where discoveries are made suggest a tracery of recorded tracks removed from local testimony or a concept of place, removed from the curiosity of map-reading, discovery or way-finding, or a notion of transit that rooted in familiarity with place. The maps for self-driving cars, as much as the vehicles or their technologies, raise questions about what the nature is of a map that is removed from recognizable concepts of an inhabited place. A considerable promise of self-driving cars to be sure lies in the internal maps with which they would be hard-wired for ready cloud-to-car delivery, with an accuracy allowing for reducing the potential of accidents while driving behind the wheel: as if accidents while driving have been ascribed to the fault of human drivers’ judgements, as much as bad road or weather conditions, and the potential liabilities of self-driving cars colliding with one another and with human beings–who is liable? the programmer? the designer of the software? the engineers who built the roads?–delivery on such a promise depends on the accuracy of the high-definition maps they are supplied. Although the market for such maps have led to steep competition between not only Uber and Google, but Zenrin, And as the surveying of road networks, highway interchanges, and road conditions, the promise of bettering travel experience lies in the odd remove of the map from the human reader. While the tools of automatic driving and cruise control seem but a stone’s throw from the self-driving cars in theory, rarely have detailed travel maps been so widely removed from human readers–perhaps the final image of the country of speed, roadways and motion that Jean Baudrillard so quickly idealized as a land of space and speed. But while the map lends itself to the fantasy, much as future maps provide powerful templates for collective betterment, the future in maps for self-driving cars may be bleaker than one might have expected. Maps have been long created to frame the promises of the benefits of increasing roadways and access to space. An early instance of mapping the promise that paved interstates would bring good roads everywhere promised an opening up of national spaces and the economy, just over a century ago–in the Good Roads Movement. At a time when roads were not uniformly paved at the same level, a situation that Good Roads cheerleaders drew attention to the obstructions of poorly paved nature of the nation in the years. 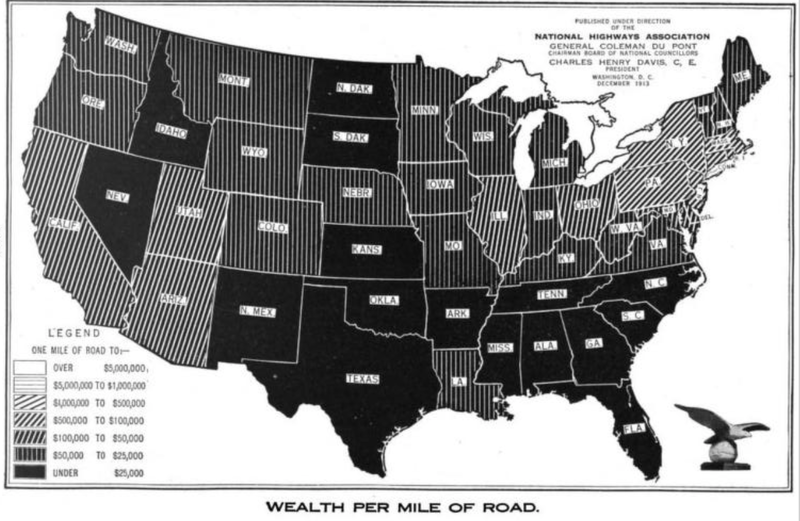 Long before World War One, they presented as a national project of economic betterment and self-improvement in a series of compelling maps that posed black-and-white arguments: in calling attention to how poorly-paved roads hinder national growth, the promotion of road-building as an economic value that have removed the existence of remote spaces or roadless areas. The promise of self-driving cars to organize road-space along maps that internalize an image of the roadways provides a new sense of driving experience. It is one that presupposes pretty perfect road conditions, in ways that may seem no certainty in an age of decaying infrastructure. For all their vaunted promise of a smoother sense of driving, removed from accident. For the patterning of automative space that inform maps for self-driving cars, instead of recording inhabited space, or the natural world, seem to pose propositions of the existence of a purely driven space, occupied less by cars or at least not by passengers but by a visualization of road conditions, in ways that eerily suggest less a world that can be filled in as a broader canvas of living or nature, but a purely man-made world, free of human inhabitants. And despite the great appeal of a crash-free world of the automated vehicle that the huge demand for self-driving cars promises, the high data density maps being developed to place space on a map presents a terrifyingly circumscribed landscape of roadways that demand attention as a way of looking at the world–and symbolizing inhabited space. Perhaps this is largely due to their machine-readable nature, as much as they increasingly “roaded” nature of most of the increasingly over-paved inhabited world–in which Pierre Ibisch and colleagues of the Roadless Initiative have found in their map of “roadless” areas to suggest the fragmentary nature of regions not defined by roads. The striking new global map of roadless areas, using open data from Open Street Map, the extent of global penetration of roadspace has in essence so dramatically increased the possibilities for human access to divide the global ecosystem into some 600,000 fragments, removed from roads, which stand only to increasingly fragment over time. The absence of spaces without paved roads–or not lying within a km of roadways–has divided much of the world in the past century so that the only roadless areas of over a hundred square km lie in the tundra or boreal forests, and most of these lands are not protected. The map of self-driving cars are not perhaps seen as motors of geographical change, but reflect a growing sense of a tacit naturalization of roadspace–rather than open space–in ways that has already defined as “densely roaded” areas in Europe, the United States and Japan, as well as much of Pakistan and India and the Horn of Africa. For one rarely appreciates the costs for what is left off the map, and the removal of the map from the roadways–and the alienated image of the roadways that they seem to present. For much like the paths of pilgrimage of medieval times, which viewed isolated itineraries in geographic space, or the disembodied paths of nautical charts imagined itineraries across the Mediterranean on compass lines, the skeletal tracery of the roadscape suggests a sense of routes removed from testimony and disembodied, distilled to the information of the roadways and a purely anthropogenic world and removed from its context, as if roads remain oddly stripped of their local references. If places are where we inhabit, the disembodied nature of the datasets of the maps for self-driving cars are removed from them, and suggest their remove from first-hand testimony–the tracery of roads being privileged over the sites of habitation that they connect. And despite the possible multiple benefits for autonomous cars, maps made for ensuring safe driverless driving test the not only the huge amounts of data that enter in maps, as well as the problems of prioritizing selective data, that raise questions not only about the richness of these high density maps, but the sorts of world that the arrival of autonomous cars register. The promises of self-driving cars that range from greater efficiency, fewer accidents, and a comprehensive data of roadways suggest a mapping of roadways alone, albeit with finely-grained knowledge of driving conditions. The intense interest in creating a map omitting roadless areas provide a scary map of the potential future of an absence of any strategy for preserving or conserving roadless areas. 1. The eerily ghostly roadways of the maps made for self-driving cars seem quite proper: for they track the road as inhabited by the car, and not by the spaces around them. If the intellectual property of tools for processing and formulating driverless maps stands at the cutting edge of recent lawsuits, is the increasingly ghostly character of maps made for driverless cars not also a serious cost? The fragmentary picture of strings of man-made space erase the notion of a pilgrimage to a detention, providing a real-time record of roads’ obstacles, speed rates and traffic density, offering clues for how the car can move across and over space, but does so in the context of distilling the roadways to the basic criteria that cars will most especially need to know, and far less about the spaces that we might visit. While made for autonomous driving vehicles, the absence of testimony and the lack of differentiation among places seems poignantly and particularly wanting. The roadways that entangle much of the inhabited earth with transit corridors demand a complicated set of tools for their mapping, but does the erasure of the experience of driving, converted into a matrix of data, also register a deep danger in how we have come to inhabit space? For if the proliferation of interchanges show the growth of roadways and arteries of automotive transport, some including up to fifteen lanes, branching out into eight directions, inspiring one netizen to ventriloquize, “Car GPS: ‘I can only take you this far, the rest is up to you,‘” imagining frustrated befuddlement at this Chongqing interchange, whose curving on-ramps and shifting elevations can hardly be untangled by data from motion sensors or GPS. The radically curtailed influence that the map offers readers stands in uneasy juxtaposition with the fears mazes of manmade roadways may even outstrip navigational capabilities. One imagines not only the sort of dialogue that might occur with automated navigational services as Siri, their GPS coordinates overloaded by the multi-directional arrival of cars on different lanes in the freeway exchange, but the difficulty–and the need–for the data density of a map for automated cars that would process the possible courses of lane changes and arcs of on-ramps in ways that the driverless car would be able to navigate. 2. All maps are made to meet demands, and the expanding market for maps for self-driving cars is no exception. But if we have become able to map traffic and routes for some time, the ghostly sense of inhabitation in maps for self-driving cars seem worth reflection–for the image of the world they create; the ethics of mapping the road conditions, and how theses maps orient us to the world. Fort he intelligence of such maps, made to be machine-read rather than read by humans, propose a different notion of the “inhabited world” that is in truth increasingly closer to the road-covered world that we increasingly inhabit. While the safety of such maps effectively allow us to be passengers in such self-driving cars, they also render a new sense of the worlds in which we are inhabitants. For the haunting ghostly worlds that maps for self-driving reproduce and create provide an odd record of our increasingly paved-over world, where roads-free landscape is ever shrinking. Are the maps for self-driving cars a premonition of a paved over future? Driving is among the most familiar extension of an embodied experience, and the most familiar experience of navigation and way-finding that we have today. But as maps are increasingly present behind the wheel, as it were, and built into many cars, today, both in the form of dashboard monitors, handheld devices, and disembodied voices, the relation of the map to the experience of driving has changed. As maps have become data and datasets, we have no only constructed far more visually elegant renderings of roads and driving conditions. As the maps for driving have departed from the over-folded pieces of paper, often ripped or worn at the crease, that used to be stuffed into the romantically named “glove compartment” and migrate underneath sun visors or into the side-compartments on front doors, into interactive experiences that we read, they have in many ways transcended our abilities for attention. And the increased demands for attention in our society and even for our drivers has led to a new market not only for HD maps, but for the maps that would help guarantee the safety of self-driving cars. –which stands to prove the most important mapping innovation since the satellite, and perhaps the most valuable ever, as over thirty companies are applying to test-run their own self-driving cars in California, seat of the future, and the winner seems destined to be the one with the most complete and sophisticated mapping tools. The tools planned to allow the cars to navigate real space don’t provide anything similar to a recognizable landscape, but Google’s driverless car division–Waymo–used the code-name ‘Chauffeur’ to refer to the armory of LiDAR tools as if to humanize the tools by which autonomous cars will be instilled with the ability to develop an effective cognitive relation to space. Although autonomous cars may threaten to overturn the hegemony of Google has retained as a mapping engine, the new remapping of the freeways also threatens a changed relation to most all extra-urban off-road space. Is the growth of the market for self-driving cars not in itself emblematic of a new relation to space, where the car is less the instrument of exploration or navigation–the Keruoac’s image of being “on the road”–but a now bulky mode of transit and commuting, whose increasingly mechanical modalities of operation seem to be best performed by an artificial driver, built-in to the car. Even as it is foretold AI is destined to replace increasing numbers of workers with world-changing effects that are only “50 or 100 years away,” we have kept fears of economic shocks and needs for massive retraining at bay, but face a profound fear of decreased human agency. The diminished agency of the human is perhaps no more apparent than in the rapid race to design maps for self-driving cars–maps read by cars to familiarize themselves with traffic conditions and their routes, in ways that dispense with human judgment behind the wheel–one of the most privileged sorts of agency in existence–even if the maps for self-driving cars are now limited to the most mechanical forms of transportation on “smart highways” and shipping routes. What sort of intelligence is lost, one might well ask, and what gained? The promise of improving the navigation of roadways is analogous to the Good Roads movement, insofar as they promote a new notion of travelled space, and a new notion of mobility in it, but suggest the notion of a cartographic intelligence removed from the map-reader. While the configuration of this disembodied network of pavement recalls the instructions for a map for self-driving cars, the range of maps that are currently being crafted for self-driving cars condense not only roadways, but road conditions, lane-changes, stop signs, speed limits, curving interchanges and current traffic conditions, all absent from the creased maps drivers once stowed in glove compartments to keep at hand, as well as the content needed for lane changing, intersections, speed limits, and navigating unforeseen obstacles that lie off the map. –maps for self-driving cars rather combine a somewhat skeletal sense of extreme data richness of local road conditions, to which they assimilate real-time information of the roads themselves, fading out all non-essentials, without any expectation of addressing a human eye. Indeed, they can’t be described, perhaps, as forms of authorship, in an individual sense, because they are “written” and “surveyed” by sensors of the very cars which accumulate data needed for their content. These maps raise the question of how the set of instructions that they will give cars to navigate roads and relate to the highways on which they travel and the traffic they also have to navigate can be a text–able to be claimed as a form of intellectual property and as a product–rather than a set of instructions, and, indeed, what sort of liability will lie within the maps for any possible accidents that occur within autonomous vehicles. Indeed, although the questions of culpability and liability are all too absent from the sleek maps that promote the range of data in such “high density” maps of the roadways, the questions of liability could not be far off the minds of their designers. But they demand to be explored, anyway, for the powerful nature of the contents of their design. The functionality of such maps reflect the sort of traffic-maps that have long been provided to human drivers, but are radically pared-down versions of the same. Take, for example, not only Wayz maps–but the improved maps of traffic intensity that are produced in strikingly color-coded precision to foreground traffic flows, rather than human buildings or monuments, but offering an immediately striking means of showing the traffic conditions of a city and its routes of traffic in Washington, DC to a human eye. The strikingly lifeless nature of these arteries seem to register degree of obstructions, by color-coding roadways in terms of personal convenience which remove judgement from the reader of the map in ways that suggest a new paradigm of map reading: rich with information, the “smart” map dictates course of driving, and demands a quite different from of map-reading–one that can be imagined to transfer more far more easily to machine-readable maps. Mapbox cartographers have worked hard with their style sheets to create a new iconography able to distinguish prominent the tunnels, show intersections of traffic and onramps, that blocked out the habited areas of lower Manhattan, unlike most any maps that were made of the area, but link driving routes to transit lines in ways that improved the legibility of routes, improving on the right-hand 1.0 to the 1.2 to the left. But if the problems of rendering the notion of progress or itinerary is already revealed in these color coded and sized streets, the density of data in the maps for self-driving cars, which dispense with the pictorial symbols in favor of parsing the density of data dots for ready access. Similar sorts of rendering of interchanges have been developed by online mapping agencies that seek to render traffic flows and in real-time, as a way of providing the sort of up-to-date information for human drivers that are especially challenging in New York, where they seem to update radio traffic, but condense a wide range of news about relative traffic congestion in ways that can be readily grasped, so that drivers can maybe not use them to navigate city streets, but at least to survey the lay of the road. The roadways indeed have been gaining an increasing entity of their own in some of the traffic maps provided by the late Mapzen’s lovely Transitland, which offered a way to imagine driving in ways that almost verge on the ability of a self-driving car. It is fair to say that maps as the below seem to use a human capacity from moving from the general overview to the specific interchange that autonomous driving cars cannot enable. The considerable beauty of these renderings in real-time lighting offer their viewers suggest a particular chromatic appreciation of the salience of the roadways that offer a further pleasure of map-reading–here combined with a sense of building heights and shadows–to capture the time-sensitive notion of traffic conditions that can be readily appreciated and intuited, as if to make the map a “smart” surface, from early morning to night. Yet in capturing the essence of travel in the map–and distilling the voyage to the essence of road conditions–the maps for self-driving cars create an oddly isolated sense of the roadway, largely limited to the paved surfaces without much inclusion of the overall pan. The disembodied nature of the maps for self-driving cars provide a new avatar of the extended of artificial intelligence and its challenge to displace an embodied experience. If maps remain among the most human of creations to orient viewers to place and space, allowing us to navigate and master a spatial continuity we can’t otherwise readily perceive, training cars to read this space depends on the challenge of conveying the tacit familiarity with roadscapes into machine-readable form. While such maps are not often considered similar graphic embodiments of space, the embodiments these maps offer of roadscapes demand to be examined. For the notion of driving as wandering–or wanderlust–seems to be skipped over entirely in the maps for self-driving cars, which one could only say that Jack “Nothing-behind-me,-everything- ahead-of-me,-as-is-always-so-on-the-road” Kerouac would find queasy-making if not downright repellent. Rather than wondering insistently “what’s in store for me in the direction I don’t take?” the adventure of rolling on for the man who preached that “the road is life” would find the denatured aspect of the roadways and roadscapes all too much akin to disembodied instructions. –the maps for self-driving cars are less concerned with intensity of travel, or pulled by the interest of sites of pleasure, work, and curiosity, but they define a set of pathways abstracted from place, but designed to ensure safety. Indeed, in contrast to the contingency of navigation or exploration in a world we know by traveling, and learn while walking, the maps for self-driving cars are a sort of synthesis of streets, stripped of cities or sites–rather than the sort of matrix of spatial relations to which we are accustomed. We’ve long expected maps orient human readers to the continuity of inhabited space that affirm regional integrity and offer needed cognitive way-finding tools. The continuity maps create makes them among the most humanistic of documents, extending cognitive skills and establishing needed frameworks for understanding space and place as less than abstractions but in concrete terms. The cognitive magic of embodying spatial relationships to be grasped at a glance functions in large parts by the success of their selective conventions as tools to place ourselves in a form of vision accessible to the human eye, condensing markers that often lie in the land to a form we can readily engage. The new maps that promise to orient self-driving cars to the roadways rather focus on charting data on flow, and the constraints of space, rather than they organize space as a recognizably continuous record of the roadways. They offer what one might call the “First World” perspective on our changing inhabited space. And so the dramatically curtailed nature of the mis en scène of the maps for made for self-driving cars offer seems to demand attention: to be sure, such maps make less appeal to human cognition, offering a purely machine-readable sense of place and of space oddly removed from human habitation. But they condense and transpose a human relation to the landscape into readable form that, in the end, serve to orient us to how we navigate and voyage through space. Is this mapping from a machine point of view, or is evidence of the new dominance of road space and roadways in an increasingly over-inhabited world, where a sense of place has been increasingly eroded within a continuum of constant transit, far more sensitive to flow than place or space? A rendition of the spatio-temporal database. Source: Zenrin Co.
–the condensation of road signs and driving conventions seek to allow a car to orient itself to space in ways that strip space of its tactile surroundings, doing the work in many ways for orienting oneself to signs located along the roads. Rather than chart location for a viewer, HD maps for self-driving cars are sensitive to capturing the constraints and flows by which a car can orient itself to the shifting traffic and crowded lanes that organize the changing terrain of highway space, an area to which so much increasing land cover has been dedicated across the inhabited world: the HD maps take the space of the highways something like as a proxy for the inhabited world. As records of the shifting space of the speedways, these maps promise to register the complex calculus of highways to promise a safe trip for future passengers. If J. B. Jackson famously suggested the rise of “auto-vernacular” landscapes in the United States whose deceptive sense of ‘placelessness’ reflected the changing middle class lifestyles of suburban tract homes and suburban subdivisions and strip housing located along highways, the maps for self-driving cars are cultural landscapes stripped of signs of habitation save the roadways. But it also seems terrifying insofar as one rarely appreciates the costs for what they leave off the map, in the selective attention to roadways. For the removal of the map from the roadways–and the alienated image of the roadways that they seem to present. For like the paths of pilgrimage of medieval times, which viewed isolated itineraries in geographic space, or the disembodied paths of nautical charts imagined itineraries across the Mediterranean on compass lines, the skeletal tracery of the roadscape suggests a sense of routes removed from testimony and disembodied, distilled to the information of the roadways and a purely anthropogenic world and removed from its context, as if roads remain oddly stripped of their local references. If places are where we inhabit, the disembodied nature of the datasets of the maps for self-driving cars are removed from them, and suggest links around them that lack any actual testimony. And despite the possible benefits for autonomous cars, maps made for ensuring safe driverless driving test the not only the huge amounts of data that enter in maps, as well as the problems of prioritizing selective data, that raise questions not only about the richness of these high density maps, but the sorts of world that the arrival of autonomous cars register. The promises of self-driving cars that range from greater efficiency, fewer accidents, and a comprehensive data of roadways suggest a mapping of roadways alone, albeit in finely-grained knowledge of driving conditions. 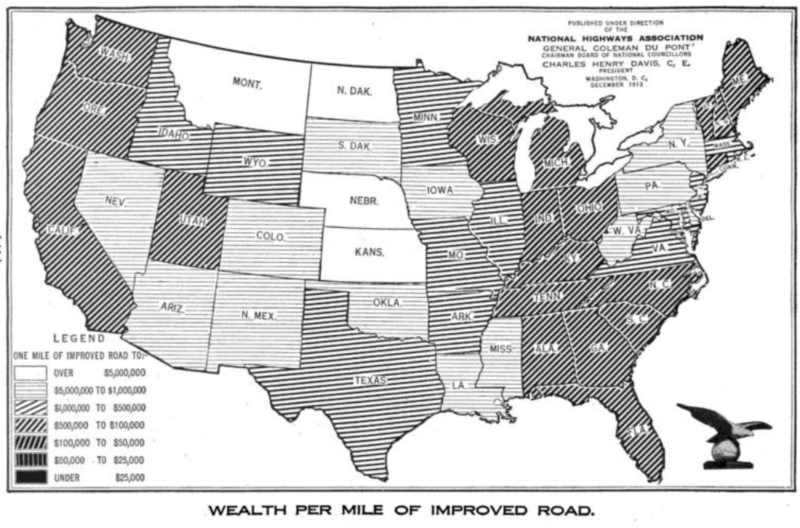 They contrast to the hype with which the Good Roads movement promoted economic development, in short, because if the boosterish boast for economic development through road improvement advanced a national highway system as a way to re-imagine routes of commerce in a newly paved nation as a new way to see the nation by the efficiency of its system of improved roadways that allowed states to generate wealth readily. –the gospel of improvement and advancement seems removed from a sense of place in the machine-readable maps for self-driving cars. The provision of these maps by sensors register real-time accounts of spatial relationships that suggest the range of tools by which we have come to orient ourselves to the world’s paved highways: yet at a time when Google Maps register space universally, from a synthesis of local surveys and satellite imagery, the maps for self-driving cars offer a downloadable cognitive framework, preserved on the cloud, for how cars can orient themselves to space by surveying their real positions on roadways, and depend less on human drivers in an age when, the distracted driving is so widespread, according to analytics company Zendrive, that American drivers use phones on 88% of the journeys they make on the road–and in spend 3.5 minutes per hour looking at their phone, and not only for directions. In an age of mass-distraction where drivers can’t be as trusted to watch the road, maps for self-driving cars are perhaps needed to reduce risk–even two-seconds of distraction on your phone increases individual drivers’ risk by 20 percent; the National Highway Traffic Safety Administration recently counted almost 3,500 people deaths in distraction-related car crashes in the United States in 2015, and almost 400,000 injured, and the problem stands to worsen as after a recent trend toward declining numbers of driving fatalities, fatalities due to distracted driving are substantially rising, and especially among teens. The statistics are unclear, as accidents involving cell phones are under-reported by authorities. At a time when paper highway maps are no longer consulted, and in fact rarely sufficient–and navigation has migrated to the hand-held phone, if not Siri, it’s no surprise the need and market for maps for self-driving cars has so markedly grown. The response to such distraction has been to provide a newly comprehensive map able to interface with self-driving cars, in ways that might allow our existing habits of distraction to grow. In a sense, this is a local–as much as a universal–recuperation of the perspective of the single surveyor, providing a local automobilistic model of mapping with advantages one can’t gain from satellite/LiDAR alone, or a filling in of the gaps. But the maps for self-driving cars are not made for human audiences, and as much as orienting individuals, offers perspectives of an inhabited world that is defined only by the extent of traffic on roadways–and which consumes increased cognitive attention of commuters–but which offers an extremely alienated perspective on the world. The shift from the schematic detail of most road maps and atlases reflects the range of 3-D topographic displays motorists using Navteq consult on dashboards, which include skies, buildings, and real-time information about traffic and road obstructions, similar to Wayz. Going far beyond GPS, the prototypes for “high definition” maps of increasingly expanding data density move from 3-D to an enhanced maps rely on local surveying in what suggest a new eagerness to make maps to move to fully automated cars, giving maps a centrality to the commercial enterprise, tied to monopolistic schemes of corporate enrichment to better life analogous to what Daniel Defoe famously called the “Age of Projectors” plagued by self-interest. Maps for automated driving claim authority by converting roadways to a new legible form, less dependent on personal surveying or extant maps, than the rapid creation and provision of a corpus of maps–or, rather, competing libraries of maps, depend on extracting data from sensors and cameras from a fleet of several thousands of cars, trying to embody a collective dataset of every option of driving on existing roads, and compiling little information outside the road-system. Are their costs, as well as benefits, in this massive assembly of a record of space? The format for mapping space purged of place-names and distilled from earlier traditions of encoding knowledge may always risk providing an overly thin notion not only of place but of history, and a marginalization of environments from maps, but in amassing the data-intensive rendering of road space–in which rendering a highway or road may require 1.4 billion data points, from medians and road barriers to curb height to tunnel breadth to sewer grates, in ways that codify the tacit knowledge drivers daily account for, the potential data overload depends on parsing a data rich record in effective ways–and raise potential questions about the interruption of data flows from the sensors of autonomous car due to weather interference, from ice to snow to pollution, And even the integrity of what we are left with as onboard HD maps of the everyday.Yet even artificial intelligence that most adeptly parse relevance of road signs and real-time images of a region’s traffic won’t necessarily align with the interests of drivers or of how we understand and live in space. Yet safety depends on the quality of maps. Maps for driverless cars open perspectives on the basic cognitive operations of maps, and of autonomous cars–“An autonomous-driving vehicle without good maps is like a human being with a missing part in his brain,” says an engineer trying to explain the need to augment existing map databases with complex algorithms of enhanced computer learning. The amplification of data in maps for self-driving cars must be paired with engineering filters by which self-driving cars will define their selectivity, prioritizing meaning to efficiently view the world. Maps have long imitated human perceptions of space; in considering the maps created for self-driving cars recently promoted as the “future of mapping,” what they exclude seems as important as what they include. While offering 3-D maps of “end-to-end” travel in HD maps, these machine-readable maps offer shifting networks offering cars the ability to navigate roads, traffic signs, and highway traffic. They may seem artifacts of an age of ADD or inattentive driving, ad actively foreground features from more data far surpassing tha existing road maps–absenting human agency from the car. A large part of the problems and promise of such maps is to parse information about road conditions, hierarchically sorting and ranking their relevance to driving, by using “deep learning” software to train the cars to best judge intersections and lane changes. The abstracting of itineraries from place is not only alienating to a human viewer, but seems mapped in ways oddly stripped of human presence. For despite their synthesis of such a map of considerable granularity, they depend on filtering the overabundance of detail accumulated by sensors in decisive ways. Oddly, and quite unfamiliarly, they create a somewhat terrifying unpeopled landscapes–rather than providing signposts a human eye would recognize as orientations or guideposts in the ways that roads were long historically defined. In amassing a huge amount of quantitative detail on how to navigate, they use sensors to encode a rich density of spatial information in what is rendered as a weirdly flattened landscape, limited to routes of vehicular transit that occupy an increasing share of our ground-cover in expanding mega cities whose edges stretch out to the start of interstates in center less urban sprawl. A large part of the problem for such maps is to filter out information, and point the car in a direction by end-to-end coverage. The primary problem of such maps is to prioritize relevant information on the roadways; the mandate to chart the road systems alone, at a remove from local context, filters the world in what seems a fantasy of speed, allowing self-driving cars to navigate the paved world from behind the wheel, rich with the immediate signs and pavement-markings that simulate the semantics of the road, independent of human habitation or local environments. The changing nature and subject of these maps may suggest a change in how we understand roads–in many agrarian societies, the metaphor of the “path” or “way,” the Chinese dao, describes a path discovered, and not followed. If maps suggest the possibilities of paths of travel and routes, “end-to-end” HD maps proscribe precisely the way that must be followed by cars to reduce risk For the format of map making can be compared less to a landscape than “roadscape” driven through. And if we take it seriously as the future of mapping, the costs of limiting its content deserves to be examined. Rather than describe places along the way, or situate place in a field, these 3-D maps suggest a road-bound notion of continuity, prioritizing and parsing the vast amount of detail that might be sensed on a system of roadways to allow the car to situate itself on speedways without accident, and to navigate roads earlier navigated followed by human intelligence and judgement. The primary problem of such maps is to rank relevant information on the roadways; the mandate to chart the road systems alone, at a remove from local context, filters the world in what seems a fantasy of speed, allowing self-driving cars to navigate the paved world from behind the wheel, rich with the immediate signs and pavement-markings that simulate the situated semantics of the road, independent of human habitation or local environments. The fate of place is increasingly difficult to assess in a globalizing world. But it’s tellingly absent from most 3-D map of what appears an abstracted “roadscape”: place disappears in the 3-D maps created for automated vehicles, which despite data-richness offer a phenomenology of the roadways that substitute “roadscape” for landscape–constructing a quite unfamiliar notion of the inhabited world by isolating a network of roads and the conventions of driving from their surroundings in quite spectral ways. In privileging paved roadways and managed traffic over place, such maps seem to say important things about our changing notions of space. Rather than marking distance points, or the embeddedness of routes in a landscape, as the trails in the American West or the geologic ridge that served as the basis for the Natchez Trace from Mississippi to Tennessee, used by Chickasaw and Chocktaw before it became the “Colombian Highway,” the network of roads are reduced to traffic signs and abstracted from local settings save elevation changes; in contrast to the man-made scale of ancient networks of trading routes, such as the Silk Road, whose rich historical palimpsest re-emerged only after the fall of the Soviet Union, as active signs of its survival as a cultural corridor reemerged. But historical signs of habitation disappear as lines of navigation are disquietingly disembodied from place, stripped from historical texture or depth, and rendered as a isolated paths: the historical texture of the three-lane El Camino Real, which snakes through Mountain View and Palo Alto, some of whose right-hand lanes are wide enough to sustain and invite two lines of traffic, becoming the site for a crash for one of Google’s autonomous vehicles, which predicted erroneously that a bus would in fact yield as it waited to turn. Perhaps until every car is autonomous, similar glitches are to be expected occasionally. But the image of traffic and mobility it creates seems scarily thin: roads loose far more than historical resonance in maps for self-driving cars, as they omit or elide accumulated judgement shared between drivers. The highly conventionalized pathways by which roads are rendered in such maps show a peculiar relation to the land, removed from walking, or from a sense of the meaning that is invested in place, home, or sacred site. A more extended contrast seems to the point. If the overland trails and itineraries across America were travelled on foot to the American West, from the Mormon Trial to the California Trail, as documented by personal accounts, and moving across space at different rates over time, space and time seem conflated and combined in the maps for self-driving cars as data of different if related registers for the car to process and learn for its spatial orientation. Unlike the overland trails that follow topography to trace ties for carriages that went West in the late nineteenth century, with different rates of survival and at different speeds, the maps for self-driving cars allow the maximum possible driving velocity within limits of safety, and remove agency from motion. In ways foreign to the framework of maps for self-driving cars, the interactive atlas of “Overland Trails” shows the place-bound nature of carriage-driven migrations when moving along overland way-stations from Independence, MO to Oregon or San Francisco along the California Trail or Oregon Trail–and which reveal the multiple varied iterations of progress recorded in diaries, stopping at forts or pausing at rock formations along the treacherous western topography, long largely defined by water scarcity, but evident as a form of exploring the local terrain and its landmarks. Time and space are flattened in the maps created for self-driving cars, which than filter high data flows about space and time to cars to foster an artificial intelligence of the roadways, and prompt the question of whether AI will provide the sort of records in drivers’ own interests after all. Likening the “huge gap between making current navigation maps and maps for autonomous driving,” to “comparing climbing Mount Fuji to climbing Mount Everest,” Zenshi Takayama, President of Zenrin Co., which has the dominant market share of tools for car navigation in Japan, said in Tokyo. Zenrin has transitioned from paper maps to digitized navigation systems, hopes to provide tools for moving in three dimensions on crowded roads to the expected 12 million autonomous vehicles that will be driving from 2035 worldwide, in what may be up to a tenth of total automotive traffic, by amplifying existing map databases with deep learning capabilities to orient self-driving cars to a system of roads, other vehicle, weather changes, and the eventual accidents. Takayama may seem to use a landscape metaphor to naturalize the subject of the map, but if Mt Fuji is a Shinto shrine in Japan, preserved from development and a sacred forest below the tree-line, moved across by well-known paths, an ascent of Everest depend on ice-conditions, moving glaciers, Icefalls, and earthquakes on which the decision of any route is contingent–the routes of ascent need to be constantly calculated and assessed. The analogy is not only meant to convey the sheer difficulty of the task, but practical problems of synthesizing such a diverse range of data. Yet the analogy may minimize the qualitatively different nature of maps for driverless cars, by treating them as if they addressed a human viewer or audience . Indeed the notion of climbing a path by practiced routes of ascent along ridges or “magic lines” suggest the sort of situated itinerary that maps for driverless cars don’t try to recreate, and the different nature of end-to-end maps that trace an entire route in real time. Risk does not exist in the different routes to the peak, but rather in the chance of a collision with a driver. For rather than suggest the sort of tactile relation to space that maps exceed in providing, the discrete data-points they gather embody less of a coherent image than a calculus of spatial relations and relatedness. If the maps primarily describe two dimensions, maps for self-driving cars seek to are orient cars in 3-D, parsing of spatial information that translates into axes of data density, mobility, and risk. The demand for real-time generation of maps for self-driving cars raise some serious questions about their selectivity and about the conventions and coverage they adopt, and how maps will be augmented with fresh information with sufficient speed to be risk-free. All maps depend on what their users expect to find, but the maps for self-driving cars gain value because of their frameworks for prioritizing information that will replace the range of actions that most drivers internalize, and register the constantly changing conditions of roads and traffic, a by prioritizing the information on the road far above the local landscape. The maps for autonomous vehicles focus on a roadscapes alone, creating a new experience of the roads oriented to cars, and not drivers, by filtering information from LiDAR surveys and sensors that relate to conditions of traffic and road signs–the sites of traffic lights; their heights; the size of cross-walks; the curvature of roadways–so that the cars, rather than their drivers, can assess where they are. In mapping images that privilege the roadscape, over a landscape where place no longer exists, and which is only habited by roads and automated cars. For such high-definition maps seek to redefine the experience of driving, promising to re-orient ourselves to the congestion of highways, offering a perspective of the roadways that determines and privileges the place and position of the individual car. The maps for so far designed self-driving cars offer machine-readable images of space, privileging frameworks of highways but able to incorporate real-time data to train automated cars to drive with low risk. Their content privilege and magnify systems of paved roads in anthropocentric ways that increasingly structure our sense of the inhabited world. By removing the “roadscape” from other perceptual contexts, they suggest the overbuilt nature of highway systems in the inhabited world, winnowing away extraneous details from an autombilist perspective on our roadways, and manifesting something like a fantasy of the unlimited expansion of driverless cars in the future: as much a marketing device as a way finding system, the promise of driverless cars is boosted without any attention to the image of a road-bound world that they offer, and the anthropogenic space of highway expansion they seem to enable. These maps suggest a radically new relation between car and driver, and man and machine, concretized in the remove of their maps from human intelligence or judgement. The cartographical operations allowing real-time feeds of information to be included in maps, together with road conditions, is a primary problem for the high-density maps created for self-driving cars. Their content reflects a spatial ontology of greater impact on the world and on our changing sense of space than we are ready to acknowledge. South Korean plans for the creation by 2020 of a system of “smart highways” for automated driving vehicles are promised to ease problems of traffic congestion and cut emissions., suggesting worthy hopes to reduce car accidents by instituting a virtual structure of traffic monitoring. The planning of routes on its already quite extensive national road system are to be replaced by “smart highways” able to accommodate traffic flows, reducing all appearance of human agency. Indeed, the mechanization of the roadspace that the South Korean government has promised will eliminate toll booths, allowing a smoothly-moving flow of cars which are able to gauge speeds against one another, and to function in a constant perpetuum mobile of the roadways, in ways that recall something like a system of die-cast cars on multi-lane highways with the by-product of ending congestion, traffic jams, and long commutes. The big promises of such maps raises questions of whether they can alone deliver a new notion of commuting and highway travel, from a system of “smart tolls” allowing cars to move without stopping along the f 1,000 kilometers of new highways that will join the system of over 5,000 km by 2020, and which promise to ensure that no South Koreans will need to drive more than a half hour to enter. Such a new system of roadways may seem far off in the United States, which must now be accustomed to lag behind in adopting a network determined by cloud-based sensors of wide-area motion imagery, creating accurate 3D maps, as much as networks of “smart highways,” seems to stand at the cutting edge of cartography. Rather than rest on web-based maps, combining the cloud and Graphic Processing Units (GPU’s) and Cloud Moving Target Tracking (GC-MTT) system suggest a front-end web-based server that could offer the real-time target recognition and tracking needed for fully automated self-driving cars to navigate road space, to avoid the un-American notion of road space rationing, even if it means redesigning our national highway systems. The maps that are being designed for self-driving cars are designed to make sure autonomous cars can navigate space, they rather uniquely organize space from the perspective of the car–in the hope to build abilities for cars to orient themselves to the growing expanse of our national road-space. As much as offer navigational tools, maps produced for self-driving cars seek to assure us of the safety of their future of such automated automobilist experiences. For the ghostly maps of roads capes that are disembodied from a broader context or landscape seem to offer the promise and fantasy of speed that underlay much of the twentieth century, of which the self-driving car is to an extent the apotheosis and end-product. For the maps embody a promise of speed, as they map for the growth of road space during the twenty-first century. The stand-alone virtual spaces that let self-driving cars to map their positions on roads chart a different way of looking at the world by transit routes, organizing space about roads as much as buildings, signposts, or human habitation, in ways that focus on infrastructure as a separate world. The models of mapping “smart highways” are organized as they are less in terms of landmarks, and more in terms of routes, focussing on the features of the road that they privilege above all else, concentrating a far greater range of data in the streets. Indeed, their richness of data almost discards the very notion cartographical selectivity–perhaps the basic premise of a map–in ways that seem to saturate the viewer with more detail than an individual glance than might be reasonably expected to readily process, inundating their mechanized readers with a floodgate of data that seems so comprehensive in its detailing of three dimensions that it might seem to, in virtual form, recreate the total landscape through which a car moves–or might meaningfully drive itself without risk–mapping the length of a cross-walk, the height of a traffic light, the angle and curve of a turn from one lane to another–in ways that map out the options of driving for automotive vehicles by registering the options and alternatives on road systems in a spatio-temporal database. The skeletal framework of driving lanes that is the basis for the driverless map provides a more explicitly detailed account of the roadways than is likely to exist, mapping the alternatives that would exist for a human driver into a template that can translate data into a comprehensive account of the roadways that cars can access in real-time. The maps promise to be augmented in real-time, by rich data feeds that themselves eliminate the confusion of overly large data flows registered by sensors or light detection and ranging (LiDAR) to see and map the world. They are in a sense a fantasy of a world of increased ADD, promising a machine-readability that focuses only on those things relevant to the driving experience, by prioritizing relevant aspects of sensed space. Rather than depend on cartographical selectivity, the software used in self-driving cars will be able to perform operations of selectivity in real-time. The maps will effectively themselves prioritize urgent matters from stop signs to lane signs to pedestrians and bicyclists–rather than note and include the full range of all objects, garbage, and overhead trees or building windows, an information overload of remote sensing which would slow down the generation of real-time maps that self-driving cars are in most need. Hence, the need for a new semantics of mapping–recognizing the most important signs needed for driving, and doing so in a way that might be eventually universalized in maps, and be able to compare sensed objects to the preloaded maps or GPS that is already in the image-banks of self-driving cars. Most visualizations seek to make people “smarter with data.” But rather than orienting human audiences to the massive accumulations of data that self-driving cars register, the stripped down data-dumps of maps for self-driving cars offer a cognitive overload, by concentrating entirely on the roads often rendered only as lines in most highway maps. For maps for autonomous cars seek to integrate GPS measurements within a framework for reacting to road conditions, lanes, traffic signs, and accidents, read by real-time sensors. Such real-time monitoring will allow cars to accurately map its place in a shifting road space, as much as a terrain, or imagine the problems of mapping a terrain focussing on the systems of roads on which it is likely to drive–and predict what lies on the roads by the amazing degree of precision of within ten centimeters. Are such maps even safe? That depends on the degree of density of data that they can accurately include. The data of distance and dimensions of each road together with other prominent features to let addition of an increased range of road condition features in real-time, from accidents, intersection density, driveways, and weather changes, as well as pedestrians. The data-rich framework would allow for crowd-sourcing a richly augmented plastic if necessarily limited record of routes, providing the sense of an infinite options of travel, and articulating a busy system of driving on roads. Maps historically concentrated on the inhabited world. But the goal of such maps is a textured account of the inhabitation of the roadways–not a selective record of space, extracting and encoding an expansive amount of local detail in order to manage the unmanageable density of traffic that clog highway systems. 7. New Navigational Tools for an Overpaved World? The maps for automated cars suggest a new register for mapping in interesting ways. While removed from any sense of “marking” or identifying place save for the space of the roadway and mobility across its lanes, the resulting maps of three dimensions creates a framework that seems to embody hopes for speed, from which any off-road landscapes recede, and the pre-eminence of paved space is enhanced and extremely data rich, to allow the car to place itself in the world. Of course, the focus is on the road-system because the stakes are so exceedingly high, and the map assumes a determinant weight of the sort that it rarely has: whereas in “a car navigation system, the liability is still on the driver,” as one of the thousand surveyors working for Zenrin navigation, a firm that originally specialized in mapping therapeutic natural hot springs and old-style public baths–onsen--which are such sought-after tourist destinations, and so numerous that the existence of over 3,000 in local communities in fact demands a map of considerable data density. But while the Edo citizens used to trek between local hotsprings in Hakone or Atami to seek out their pleasure from a geothermal spring–local onsen run from Hokkaido in the north to the Okinawa islands of the southernmost islands–modern Tokyo is dotted with onsen made by drilling to geothermal springs. But the sense of walking along a path seems removed from the traffic streams in maps for self-driving cars, although the notion that the car should be trained to notice local details seems somehow Japanese. The notion of the naturalization of the map As the surveyor Fumiaki Kohguchi, put it, “But for autonomous-driving cars, the liability could be on the maps.” Such natural springs are a far cry from the data streams required for navigation, but the the local surveys provide the secret to a more comprehensive treatment of the roadways. Yet the displacement of all detail to the road system suggests a concentration on our future roadways allowing the software of automated cars of the future to augment with recently sensed items and moving objects, from pedestrian, vehicles, and construction zones, completing a picture of where they are located on the roads. Zenrin Co. is the largest mapmaker in Japan, and has received a large investment to translate its detailed knowledge of Japan’s topography into driverless maps. A surveyor at Zenrin, Kohguchi was assigned to complete in the Bunkyo district of Tokyo, by a specially outfitted car monitor the roadways. The car allowed him to gather sufficient data for a 3-D map as its high-precision lasers measure lanes and traffic signs for a spatial architecture of Tokyo’s roadways. So different is the map from all earlier forms of street mapping that surveyors have effectively re-surveyed Japan’s road space for its product in what it sees as a form of “thinking highways” to allow cars to re-think its road space–that translate road space into a navigable system. The premium on translating data of roads to a three-dimensional record of roadways use “structure-from-motion algorithms” to create a sufficiently detailed 3D mapping space for cars to situate themselves while driving. A high precision sensors on car gathers data on lanes and traffic signs. 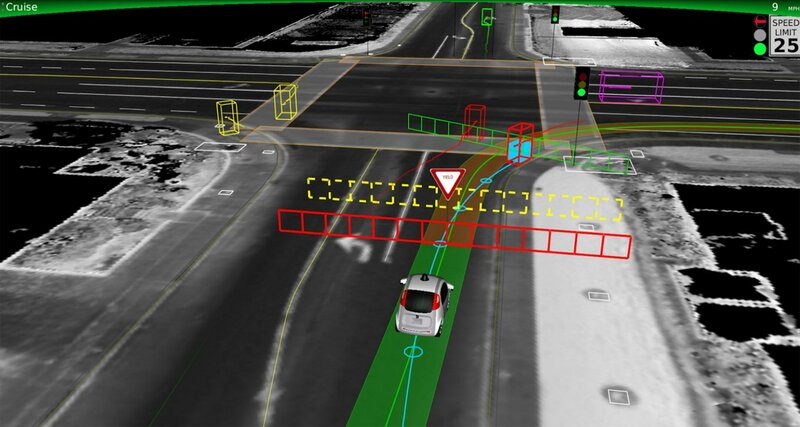 The hope is to create a framework for mapping that was destined to compete with the maps made by Mobileye, an Israeli firm which has made software for driverless cars from before 2014, partnering with General Motors and Volkswagen, and German-based HERE, a mapping unit purchased from NOKIA by Audi, BMW, and Daimler. So carefully calibrated must these routes be that HERE boasts of an accuracy of mapping to four inches; an even greater level of detail is needed for imagining risk-free fully automated vehicles. The mapping tools Zenrin has concentrated on are designed to gather crowd-source data in real time from sensors attached to automaker’s cars. Zenrin hopes to fashion such 3-D roadmaps for clients at Google and Toyota by 2020, and has already intensively re-mapped much of the Japanese road-system by its own surveying cars. To expand beyond tourist maps of onsen, sites of natural springs that were long transmitted in the landscape, the expansion to a map for self-driving cars is in a sense the next level of mapping routes for a market for automated cars. Spurred by investments from Toyota, Zenrin has grown as a way to market local knowledge in a market for maps of self-driving cars. –which partly provided the basis for crafting frameworks of maps for driverless cars. Such map will, no doubt, help orient us to a globe increasingly crisscrossed with road space that the driverless car will be able to freely navigate, presumably no longer bound or constrained by the limits of human attention spans. But we anticipate the mechanics of harvesting the information for such maps and the sorts of spatial cognition that they offer–and the complex portraits of an ever-mobile world that these three-dimensional maps create. The absence of selectivity in maps for driverless cars or autonomous vehicles is as important as the degree of precision that is necessary for such a cloud-based map. The maps leave much of the space other than road space off the map. Roadless areas are dark areas of the map, inverting the manner that many maps privileged sites of human habitation: for the habitation of the roads is the subject of these map. By allowing cars to compute their locations from a combination of sensor-derived and GPS data, and even exploiting LiDAR remote sensed surveys of roadways, the firms create maps removed from human cognition, if drawing on the most human-engineered of structures–roads–to understand space.. Indeed, the hope to calculate real-time records of spatial position and create its own internal map have led to the structure of the map being rethought as a plastic cognitive web of assembling data that is always moving, and is of necessity data-driven, since the plasticity of the map is their basic selling point. For the maps made for self-driving cars are something like armatures of the roadways, which would allow cars to use AI to orient themselves to the automotive world. They offer little off-the-road context, but evoke pure directionality, in a fantasy of speed and autonomous driving from which coherent landscapes fall away. Rather than allow human readers to name or recognize place, maps devised for self-driving cars offer non-human readers a model to order what are fluid and mobile positions in the world: these maps transfer the calculations of place to the automotive intelligence of the car, offering the possibility of automative mobility. They are unique documents of a culture envisioning how driverless cars move across paved space, navigating the networks of paved roads clustering around our mega-cities and urbanized areas. The car is equipped to drive with little localized perception of space, in which data processing will be located in the vehicle alone, and the times of communication between vehicles and cloud shrink to something like effective real-time. The disembodied nature of such motion on a road-scape seems designed to allow increased acceleration, and allow autonomous cars to communicate with one another. This is, of course, quite a different notion of autonomy the one might associate with a human subject. As much as offer signposts that human readers would recognize, the information relays that maps for driverless cars encode suggest weirdly flattened landscapes, not able to be inhabited but designed to ensure they are driven through without incident–a map without clear or fixed destinations, where roads are able to measured in real-time to reflect traffic conditions, lane closures, road repairs and obstacles: place is replaced by ribbons of roads. The directionality of the roads and the speed of travel trump place; the hope is to create highway maps whose data richness has enough flexibility to allow cars to track their place in a road space–paved or unpaved–of which paved intersections are most carefully mapped. Maps designed for driverless cars, using data gathered from vehicles mounted with sensors and cameras to create a sense of road conditions in real-time, provide the possibility for autonomous cars to “learn” the limited, if semantically quite complicated highways and “roadscapes.” One would not like to imagine much room for trial and error. In contrast to a landscape we inhabit, and describe a road-scape that is in itself fluid–as the images that Zenrin creates of real-time roads that create a landscape ready for deep learning, and other crowd-sourced real-time maps that will furnish requisite levels of information for autonomous vehicles to navigate streets and harvest information, and invite users to develop increasingly detailed maps over time that register data processed offline for cars’ ready consumption. The maps made for driverless cars untangle the landscape of an increasing density of roadways we’ve built–of which the self-driving car is to some extent the reflection, end-product, and which becomes the framework that the driverless car needs to internalize to navigate the national road space. Rather than map space as it exists for human cognition, cloud-to-car relays filter a huge quantity of immediately amassed data effectively to make sure safe navigation as well as orient cars to paved space–amassing and relaying variations on road conditions of the sort which we rely on traffic reports over the radio, but hope to make internal to fully automated cars. Roads are among the most-mapped networks of human communication, and provide a surrogate for commercial networks and habitation across the United States, whose glorious density this map including 240 million segments of individual roads across the lower forty-eight impressively synthesizes, and which in 2009 was redone with TIGER/Line shape files from the U.S Census, which strikingly suggests the deep irregularities of the spatial distribution of roads of every road in the United States–paved or unpaved alike. The massive shape files of coordinate data maps only the basis where self-driving cars would orient themselves, and use as their basic spatial framework and frame of reference–and be able to bind temporal variations in traffic flows in a form to be able better to navigate, as much as correspond to familiar notions of legibility. Whereas a road maps shows clear clustering around cities that defined extensive road density reflect centers of population and huge urbanized expanses, as well as the density of car traffic and automobiles congestion. The map by Reddit user “WestCoastBestCoast94” to suggest the relatively open areas on the west coast–save the Los Angeles-San Diego highly trafficked shores–in comparison to the east coast, as if in a polemic statement about the coasts: we are increasingly in danger of confusing the road and the coast, but can see one is far more darkly defined by the congestion of cars. The landscape for self-driving cars are not meant to recreate a human perspective, after all, but driven through; to that extent they are an alternate embodiment of the road map, although they go far beyond it in local detail. Despite the incredible detail of this skein of paved land cover, the activity of the country and its social fabric lies not in the road network alone–despite the rich infrastructure they offers, but the sites that they link and bind, and traffic flows that they contain. (One remains struck by the relative inefficiency of its dense tangles, and the problems of an utter absence of selectivity–despite the obstacles to roads against natural obstacles, the web of infrastructure suddenly encountering open spaces in the natural world, or bunching up in black webs of increased road-density around centers of population.) The success of binding data to the system of roads and highways across the country offers the best index of the scope of data that maps made for self-driving cars. The country rests more often in gaps within this network–the blank spaces on the map, including rivers, mountainous topography, and lakes–as well as their balance with the dense black nodes of urban and extra-urban agglomerations able better apparent at a local level, if not in print. Indeed, a closer examination of the national road system may help to unpack the sites where such a system of self-driving cars evolved, and the sense of an interlinked network that enabled the self-driving car. The irregularity of roadways more clearly appears in regional maps. New York State nicely reveals steep discrepancies between the paved and unpaved, and extreme and disproportionate density of the concentration of roads in inhabited space, concentrated at select sites of densest habitation. The designers of maps for self-driving cars face the problem of mapping not road density, of course, so much as road navigability–and doing so in data rich ways that include questions of up-to-date road conditions that can be processed with spatial accuracy, and even depend on the precision of local accuracy for their value. But the huge density of traffic–and inability to accommodate even the largest multi-line highways to traffic flows that never seem to stop from commuters–seems to have made commutes almost impossible, and whose broadly based provision of internet services provided a new basis for imagining commutes. For the commute-times that have worsened beyond even Los Angeles in recent years have created an incentive for imagining automated driverless cars, encouraged by a broad expansion of wifi across the region, far more linked to the web and cloud than most of the United States remains. For in the Peninsula, Google had, in fact, already confronted some of the very same questions about how self-driving cars would actually navigate the street ways–particularly intersections and traffic accidents, let alone road conditions. The minimal hands-on input has been a major obstacle to their development, as would be the sort of glitches that crop up quite regularly in some mapping apps. Google has played up the hype and the boasts of Google’s Waymo and its predecessors: “Imagine if everyone could get around easily and safely, without tired, drunk or distracted driving,” Google entices us to desire the driverless Waymo; its website earnestly appeals to clients, “Time spent commuting could be time spent doing what you want to do”–spending less time Googling directions, even in the sunny tree-lined suburbs of Sunnyvale. Indeed, as distracted driving has been directly tied to an increasing number of fatalities–standing to rise to a number above 4,000 in 2017, as growing numbers are lost yearly on national highways, in a 7.2% increase from 2014 to 2015–and traffic fatalities grown 14% in two years, with an 11% growth in pedestrians killed; with the most pronounced growth in distracted driving among newly licensed teen drivers, the problem of driver distraction stands only to grow more serious. The claims to have based its maps on some 300 years of human driving experience is pure hyperbole, and of course is largely confined to city streets. Even claims of 1 billion simulated miles driven in 2016 alone, and raises questions of how a sufficiently plastic map could be readily redrawn to allow drivers to feel safe, however–in ways that went beyond the network of a select range of city streets. And it is this problem of a relative paucity of groundcover quality of road networks that cloud-based mappings of the routes of driverless cars aims to somehow remedy, by excluding them from its map–another set of mappers might be tasked with finding ways to preserve that local knowledge, while drivers relax behind seat belts in automated cars. So far, the four regions where Google has focussed in mapping car routes have compiled an only partly sufficiently compelling road atlas to make customers sufficiently confident about the abilities of a prototype. The maps have been made without raising questions of liability for any eventualities of accidents occurring when driverless cars might hit unsuspecting pedestrians, or collide with other cars, to the shock of human drivers. Yet the lack of a large coverage of open roads raises questions about how such information will be compiled, stored, and updated over time or in real time, and chosen spaces that seem particularly well-paved. The combination of a map of routes, however, and a comprehensive real-time high-density data feed of traffic conditions and flows remain the elusive target of the maps for self-driving cars. A point of interesting comparison is the charts of navigation of the late middle ages, and the first attempts to reconcile nautical technology to space by means of compass lines. Such charts imagine directional axes of nautical travel between ports, or coastal cities, and foreground networks of a nautical space with only limited reference to the inhabited world. Such detailed detailed portolan charts, showing the shores of the Mediterranean and probably composed of composite of individual coastal maps, seem to have helped orient ship routes when they first emerged from the thirteenth century, offering a basis to imagine Mediterranean sea routes in oceanic space, and allowed sailors to return home or long shipping distances to be imagined. They provided some of the first synthetic maps of shorelines. The charts are not properly descriptions of space–or of a known world–but orient ships’ captains and mariner on the largely commercial travels that they increasingly planned by the fourteenth century, in ways that called into being the creation of ‘portolan’ charts, which served to supplement written directions for nautical itineraries or routes or “portolans.” The secondary status of such charts has created considerable historiographic debate as to whether the trajectories of compass lines sketched on charts were used by pilots to orient themselves to open seas–or what sort of concept of space, or ontology of space, they encode, largely because they prioritize individual ports against a broad schema of compass points, repeated in the motif of the compass rose, that appear to orient pilots on courses of nautical travel. But the maps that were kept in trading houses seem to have offered the ability to plot courses of trading routes, or possibly suggest the extent of voyages, as well as orient pilots to the shores and the waters over which they travel. The presumptions about nautical continuity they contained may have created something of a cognitive obstacle to charting terrestrial continuity, as such charts primarily privileged a notion of nautical travel. By orienting the itineraries of Mediterranean travel on rhumb lines oriented on a compass, and privileging coastal ports and cities as their primary way stations, they saw the oceans as the primary surface of spatial transit–and spatial travel, or suggested the shores as a set of points that constituted the range of possible destinations or ports of call available for nautical itineraries, imagining spaces of travel,–rather than terrestrial continuity. For distances to be measured on a sense of terrestrial continuity that didn’t privilege marine travel, terrestrial maps increasingly turned inland, sewing the coastal regions as limits, and less as ares of exchange. The growth of maps that oriented viewers to inland inhabitation often privileged fluvial networks of travel, taking rivers as major points of orientation to space, and viewing the coast as a far less crowded site of habitation or orientation. Such maps are striking in their differences because of how they provide collective frameworks for collective notions of continuity and points of bearing. They remind us of the absence of destinations in the sorts of interfaces of self-driving cars will rely, and the motion-based nature of these maps. The different sort of continuity is faced by designers of the maps meant for driverless cars, rooted less in a human experience of spatial travel. For the synthesis of data points to orient self-driving cars to roads abandon points of reference that foreground human habitation, as they have far less interest in recording or transmitting anything external to road conditions. Unlike most any map that has been made for human audiences, continuity only has meaning for the driverless car where it lies on the road–such maps hence dispense with notions of continuity encoded around human settlement or topography, even if the topography they chart is man-made. Rather than the embodiments of a coherent space maps present to human readers–and led many to define the map as a “human” medium that presents one’s own place or spatial location in a broader canvas or interface of a densely detailed geography –the perspective of the driverless car omits pedestrians or points of view. In binding data to graphic elements, maps for driverless cars only include data from sensors that the car needs to know. Although the space that they map are designed for cars, rather than people, they privilege space in terms of speedy itineraries–motion across roads–to the exclusion of the their surroundings or even land-cover surfaces. As it moves through space, the sensors on Google car’s internal map at an intersection create a “screen” that orients the car to three dimensions by laser range finders, aggregating information on its own to develop new forms of way finding–although the very high-tech principles that allow the car to navigate through “space” prevent accurate readings of distance beyond a hundred meters, in large part because of the limits to encoding reliable data within a single comprehensive map, already enriched by almost 1 GB of data gathered per second, which must then be filtered and digitized for driving purposes. While much of the LiDAR data may err, as the GPS data that cars use to plot their courses, the use of sensor derived data algorithms to update vehicle position is crucial to reducing uncertainty–and danger or risk. Despite a worthwhile focus on questions of liability, the world that is being mapped for autonomous cars bears some reflection in itself. The problem of how to map time and space–and to bring them into harmony on the map–has never really existed in a non-localized way with such particular urgency to the detail: weather maps are broadly based; local guides to traffic like Wayz are apps that are designed for specific situations and drivers. The challenges for rendering continuity is confronted by the designers of cloud-based computer-generated maps for self-driving cars that synthesize multiple points in a skein of travel conditions. They include few markers of the world, and note no pedestrians or wildlife; cloud-to-car mapping system will allow such vehicles to read roadways and driving conditions, in one of the most ambitious cases of “real-time” maps made for non-human audiences, that bridge the map as a human artifact and its machine readability by orienting automotive traffic to space. Hence, the sorts of maps that are currently produced to map “end-to-end” travel for self-driving cars like Nvidia are a new frontier of mapping, providing real-time records of the conditions on ribbons of roads, able to be kept up-to-date and comprehensive by providing an architecture able to assimilate new types of data in the cars that will be provided deep learning algorithms to detect lanes, signs and other landmarks in LIDAR. The conditions of roads that can already be read up to twelve hours in advance, leveraging greater than a trillion data points to tabulate the length of a trip taking into account real-time traffic conditions, traffic flow in recent years, and local temperatures, provide an effective database to suggest the far greater range of information a diverges car can effectively access. Is this way of taking the roadways–a central site of tacit and collective knowledge, transmitted collectively among generations, tantamount to altering their character by isolating them from space? While based on creating a machine readable architecture of navigation from GPS data, the image of space that these maps for self-driving cars pass on is stripped of recognized sites of interest, signposts, and local context as if to streamline a spatial architecture of the road. What does the creation of such an architecture of space tell us or say about the cultures that produced it, which places a premium on machine-readability of up-to-the-minute traffic? The focus on routes suggests a focus only on motion, where the system of roads and conditions of traffic replace the inhabited world in ways that oddly echo our increasingly paved-over world. The status of roadways–the quintessential human creation, even when one speaks of inter-linked highway systems–has so rapidly intensified over fifty to seventy years that the growth of webs of car space have shifted most of our attention from the in-between, as the expansion of roadway views, routes for interior penetration and roadside advertising and attractions has created not only a landscape for distraction, but overlooked many of the habitats that one might have thought remained in the sides of increasingly complex cloverleafs or the medians of highways, but are effective “dead spaces” where no habitat remains. The decline of urban gardens is as radical, but the growth of paved land cover is less noticed and, from the car, less seen. The expanding growth of national highway systems (NHS) to some 160,955 miles (259,032 km) starting from the Interstate Highway System offers perhaps a quintessential register of man re-made space as automotive, or designated for human-driven cars. Although this space is not often urban, in a city like Tokyo, where much of this post was written in Azabu-Jūban, a residential part of Minato City, Japan, where cars run up on-ramps to raised platforms of terraced freeways and urban expressways, whose tapestry of concrete platforms twist overhead as if they might contain driverless cars, moving at an orchestrated combination of speeds across the city. The perptuum mobile of the city cars seem a shadow population, always in motion, in multi-level traffic patterns whose arced on-ramps and curved borders in Minato-ku eerily recall the dioramas of model die-cast cars, blurring urban and suburban in a liminal space not really part of the city, but are subtracted from its space. The spaces of roadways and urban expressways are not only foreign to urban life, but outside of it, and at a tempo of their own that is disjoined from the surrounding landscape not only in land cover or use. Indeed, the growth of such urban highway systems seems almost to reflect a setting aside of space for cars, and for transport lanes, analogous to the train systems that similarly exist for JR rail in Tokyo, and almost in a mirror reflection of the dedication of garden spaces, spaces for temples, and spaces for cemeteries that seems to continue to define Tokyo. The segregation of such spaces is unlike the spatial design of modern American cities, where cemeteries, parks, and green space have been pushed aside by modernity. The continued romance of the road, in other words, and the optimistic ideal of ever-increased speed, has continued to animate the expansion of highway maps from the first interstates. The same ideals have provided a view that privileged the routes we regularly use to move among our communities, with the dangerous result of diminishing attention to measure the rapidly reduced integrity of the areas in-between, those interstices of the roadways interrupt the fewer and fewer habitats that remain, leaving few regions of the land designed for driving, but where roadways threaten to marginalize the in-between to such an extent that little space is in-between at all. –that may respond to the already crowded congestion of daily truck traffic that crowded the nation’s highways by 1998, according to the US Department of Transportation, emitting a huge amount of CO2, and creating a gamut of environmental problems not registered at all on the map which sees truck traffic as something like the nation’s life blood. and standing to create something of an almost apocalyptic vision of overcrowded freight traffic by 2040 of long-haul traffic across the continent. The expansion sion of such huge tonnage of freight traffic suggest not only a huge source of carbon emissions, but a dystopia against which the self-driving car provides a sort of needed relief, reducing the hours logged by truckers, if perhaps at an unknown cost. The huge density of passenger traffic in Europe’s roadways have similarly fragmented the livable space of much of the continent, not to mention the health and integrity of its ecosystems. Driverless cars will not change this–they may indeed only intensify this loss and augment the growth of road space–if one hopes they might be combined with something like a break on it, it is hard to imagine a decline in daily road traffic without huge market controls. 10. If these spaces sometime seem as if they might as well be driverless, the possibility of smooth traffic their raised ramps offer has created something like a collective framework for driving through space on smooth surfaces: the huge amount of money invested in developing driverless cars may distract from the absence of a comparable investment in infrastructure on which cars could so readily move; the maps seem to hide the absence of any requisite investment in asphalt resurfacing or road quality, all absent from and elided in the cloud-based road maps created from driverless cars, which oddly imitate the optimistic idealism of highway maps of the 1950s, and to imagine that the vehicles of the future can move on roads, bridge, and freeways that will maintain themselves without cost, although the pace of their increased erosion of ecosystems and subtraction from public space are increasingly acknowledged, as the costs of such a dramatic expansion of road space is increasingly recognized. The maps made for self driving cars create continuity by synthesizing a gamut of optional itineraries, to allow future developers to create and crowdsourced information that will allow self-driving cars to map their courses in relation to other self-driving cars, and be updated. The aim is to note in particular plastic ways the calculus of road closures and construction projects, as wells traffic jams or meteorological conditions. The sort of dynamic maps that cars would depend on gathering information from sensors embedded in cars, in ways that mean the map would be, in an extension of the ways that all maps register a collective knowledge about space, a sort of neural network animated by a huge data flows that far exceed what a human audience would be able to process, and for which to real template or model in most real-world maps now exist: the expanded ability to incorporate and code data within the surface of the map, and indeed to give it greater plasticity is being pushed most dramatically in the maps that are being created for such cloud-to-car relays create new communicative webs for future cars that don’t yet exist. But the problem of road-building is something that these maps seem to presume, or skip over–presupposing the surfaces and setting up potential liabilities by directing our attention only to how we might measure traffic flows, without transmitting any sense of road conditions. There is no claim to take such considerations into account, but the idealized forms of cloud-based mapping for future cars omits any human judgement of the consequences of road wear or uneven pavement, creating a closed circuit of car-to-car communication that seems to challenged the man-made nature of maps. The machine-readable and -generated cartography developed by groups as Here, Civil Maps, and Nvidia will require abilities for the easy localization of multiple vehicles in the most economic form, but synthesize huge ranges of data in new forms of machine learning and graphics cards able to synthesize high levels of data streams in a sort of multi-lane perpetuum mobile of the roadways. The dynamic platforms that are poised to evolve with the introduction of self-driving cars may be hard to imagine, but a range of companies are trying to create the mapping platforms that would be needed to allow them to grow. HERE uses the sort of “Predictive Traffic Maps” that can help plan journeys up to 12 hours in advance, by using more than one trillion GPS data points to estimates how long the trip will take will take by factoring in real-time traffic with historical traffic flow data and other factors such as seasonal conditions, creating a skein-like map of color-coded routes of individual automotive itineraries. The skein of routes seems oddly removed from their surroundings, and, oriented only to driverless cars, removed from the effects of the roadscape or the surfaces of the roads, providing a means of mapping by automotive movement alone, imagining a universe of cars taking to one another. The resilience of 2-D maps to describe the routes of self-driving cars is amazing, given the considerable complexity which they are able to process. The continuity that exists in computer-generated maps from data points that orient self-driving cars to the roads that they travel similarly include few markers of the inhabited world, since they register only the options for navigating lane changes at an interchange; the continuous lines offer optional itineraries, as it were, in hopes to allow developers to create and crowdsource information to allow self-driving cars to map courses in relation to other self-driving cars, and be updated in particular plastic ways to reflect road closures and construction projects, traffic jams, or meteorological conditions. The dynamic maps in such cars depend on gathering information from sensors embedded in cars, in ways that mean the map would be, in an extension of the ways that all maps register a collective knowledge about space, a sort of neural network animated by a huge data flows. While suggestive of three dimension, the two-dimensional nature of the mapping of travel seems a bit of a throwback in an era of data-driven projections and complex mapping. The dehumanized nature of the roadways, vegetation, and signs of human interest, which seem reduced to a spectral negative land world out of the early days of night-vision glasses or the Twilight Zone suggests a landscape evacuated of the human, or just a crude version of VR. But the map that is designed for the self-driving car is primarily designed only for its routes–so its fit with any imprint of the manmade nature of the map seems more like a remnant or an obligation, and an atavistic survival that will soon fall apart from the sleek organization of the map, which fittingly if uniquely privileges the directional paths of cars over all other aspects of space, showing their trajectories in an oddly disembodied landscape that augurs a future world foregrounding cars against a washed out world in an Mad Max, but where cars talk to one another through maps, knowing the world as it is meant to be driven across and privileging only the paved parts of the inhabited world. The aim is to complete a set of data on road travel would supersede Google Maps by driverless, Siri-free mobility. The data that the computer platforms in cars would digest, sift, and correlate routes to produce a readable map may merit the tag “HD Maps”–meant to suggest “high data,” instead of “hi-definition,” which is more of a tweak than a different mode of collating or assembling readable information able to be stored in the cloud for instant use. The car would itself become a node to relay augmented information, amassed through forward-looking cameras, forward and rear radar sensors, and OEM’s for transmitting the harvested data to a cloud, to create a readily updated map each and every day that includes the needed traffic updates in data flows and to localize themselves in traffic flows, far surpassing the level of data that might be registers in Google Maps cars, and include roof-mounted sensor mast packing 96 megapixels’ worth of cameras, a 32-beam Velodyne LIDAR scanner, and highly accurate Novatel GPS Inertial Measurement Units to generate sufficient data for a sufficiently flexible road map for other driverless cars. The resulting readable map able to record current traffic flow conditions would be relayed other self-driving vehicles, who share among themselves, as it were, a record of real road conditions. The ambitions of the HD maps of roadways start from a new model of mapping, unlike the sense one has that Waymo is building on the platforms of Google Maps. The sense of rebuilding the nature of the map from the ground up for cars to talk to each other in ways able to be accessed from the cloud has created considerable excitement about the innovative nature of maps that need to be devised for self-driving cars among Google’s less secretive competitors. “We’re essentially building the road network in order to have this map available for the first fleets of cars that are going to be leveraging this technology that are going to be showing up on the roads around 2020,” explained Sanjay Sood, Vice President at Here, one of the companies now building platforms and gathering the enhanced level of data necessary for such a map to include and encode to allow self-driving cars to make decisions not only about directions, in the manner of GPS, but enhance the network of roads with constantly updated information that would allow the car to read, include, and process the necessary information on road traffic and conditions in regularly updated ways that one hope convince future clients of their reliability. But it makes sense to consider the implications of such a collectively harvested map, for the very reason that it ignores what lies off the roadway or paved land. The road conditions of much of the paved world is, of course, changing our own ecosystems in ways the one only begun to be mapped in ways that fully accord complexity to their impact on the land, or to be visualized in relation to roadless regions. Maps for self-driving cars in a sense may map the fury roads of the Mad Maxes of the future, where a crisscrossing roadmap of self-driving vehicles expands to exclude other ecosystems, literally dividing the inhabited world into fragmented ecosystems, most too restricted to furnish habitat to wildlife or allow ecosystems to emerge: the splitting of the inhabited world into some 600,000 fragments is in a result of privileging a map on which one drives from the landscape–and indeed of the altered space of landscape which has morphed into the scenery which one drives by, and does not inhabit. The danger that we obscure the existence and value of the dramatically decreasing extent of roadless areas of the world seems the flip side of the portrait of the world that is offered in maps for self-driving cars, which focus only on the roads that connect human habitations, and offer what may in fact be the most anthropocentric maps ever made. The expansion of roadspace on the world’s surface is slated to expand by 2050 by some 60%, creating a scenario that will be doubtless fueled by the growth of the technology of self-driving cars, in ways that should force us to examine the sort of maps that such cars stand to use, and the limited worlds they portray, despite the richness of data that they are able to encode. The mirror on national road space that is generated in North America excludes not only the roadless spaces of the world. The global context of the expansion of road space is of course also absent in the cloud-based road atlases being fashioned for the driverless car. The current rapid expansion of complexity of the road-scape has already led to the obliteration of the prominence of spaces of ecological value, however. If one wants to be pessimistic, the remove of vast areas of roadless space–barely 5% of which have any legal protection from the tundra to rain forest–in ways that have splintered wildlife populations. Estimating that land within a km of the road is affected by its presence, scientists at Ebserwalde University for Sustainable Development, in Germany, argue that the striking failure to conserve, restore and monitor roadless areas stands only to increase the rising pace of mass extinctions which increasingly threaten our ecosystems. For Pierre Ibisch, only some 7% of roadless areas remain greater than a hundred square km, and his teams analysis of open-access maps of 36m km of road space across the world’s surface allowed him to compute rather quickly the quite scary fact that based on the Global Roads Open Access Data Set (gROADS) of mapped roads–a very conservative estimate, in fact. For over half of the 600,000 fragments into which roads now divide the world exist as marginalized spaces of less than a square km., not offering significant ecosystems–in ways that place the United States as among the regions of the most dramatically reduced roadless space worldwide. The prospect of mapping car routes with almost no attention to the spaces outside the roads seems a dangerous privileging of the paved surfaces for road travel that have already restricted not only open spaces, but habitat. The problems of privileging the ribbons of road that run criss-cross the planet’s surface ignore the huge impact of land cover changes that asphalt introduced, of course, or the expansion of road-rich infrastructures that not only allow the exploitation of resources and pollution of most regions of the world, but dismember the ones able to support life: the eastern seaboard of the United States and the nation of Japan are without regions unaffected by the presence of roads. To be sure, greater low-emissions vehicles may cut vehicular pollution, but the crisscrossing of a network of paved space have left much of the inhabited world with no sense of areas populated by animals. For roads have increased the areas able to be inhabited by insects, removing them from natural predators, and remove all remaining roadless areas from any legal protection in ways that the maps of leaderless cars echo in not deigning to record or orient viewers. The sustained failure of governments to map the expansion of roads, and to privilege roads as arterial frameworks facilitating economic expansion and infrastructure, have blinded us to a sense of their environmental consequences. The generation of machine-readable maps of the mobility of driverless cars along a similar road space suggests a diminished and compromised world. The nature of movement the along similar pathways exist for the neural network generated by self-driving cars exist in isolation once again from they impact of roads on environments, and the mapping of the external world from the vehicular point of view stands to only increase the extent of our remove from a roadless world. Perhaps the two-dimensionality of the maps of road space that result place us at a further remove from monitoring the existence or presence of unpaved lands, or even acknowledge the border between the paved and unpaved. For the world that they represent is the world is it is paved. The danger that it remains both overlooked and underrepresented in the maps that are made for self-driving cars reflects the increased fragmentation of ecosystem that have become a characteristic of our increasingly road-divided worlds. Which brings us again to the quandary of mapping the road system that stands in danger of deterioration and congestion for the driverless cars that so many are working to produce to remove people from the inevitable road congestion of combing years, or at least from behind the wheel. The problem of growing congestion of America’s roadways are not likely to end, but rather grow in unexpectedly complicated ways with the technological changes posed by self-driving cars. Whereas the demands for increasing roadways and road lanes to accommodate such a surge in automotive traffic will depend on the ability to create more miles of paved roads, the costs of such creation are not clearly able to be funded and lie far off the map–as do their impact on our landscape will be a significant step in an even more dangerous direction of terraforming. Is an actual danger that the automotive perspective of driverless cars maps stand to accelerate further the absence of attention to areas off paved roadways? To be sure, the notion of mapping driving routes at a remove from human pathways, and alone, only remind us of the dangerously growing scarcity of what Herman Melville famously used to describe a Polynesian island that was one of those already rare “true places” that are not down on any map. These are the interstices one might discover by chance, and not find written down–the places at a remove from anthropogenic noise and lying in the roadless landscapes we can discover.